I never was a sweet breakfast person. That changed with pancakes. Pancakes are now my favorite weekend treat (and when the time allows it on weekdays too!). And I see that you’re a pancake-loving audience as well because the vegan Banana Bread Pancakes with chocolate chunks quickly grew to be my most popular recipe of all time (with over 100k shares on Pinterest). So… I like pancakes… you like pancakes… we should all eat more pancakes :) I’m glad we’re on the same boat! 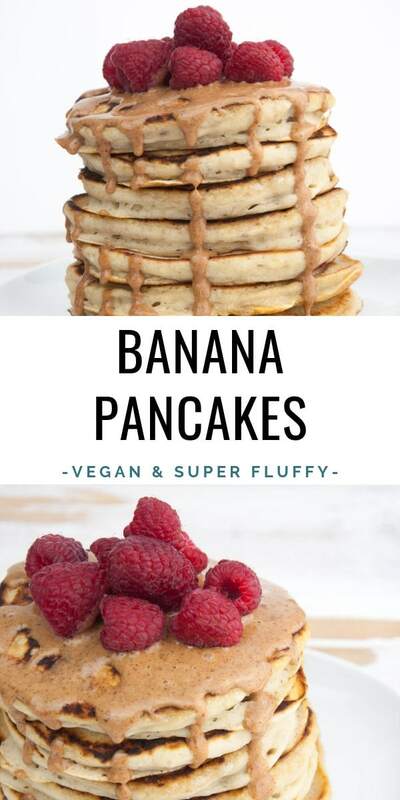 These Fluffy Vegan Banana Pancakes are inspired by the Banana Bread Pancakes but stripped down to the bare basics without missing any of the fluffiness or flavor. I’ve topped the pancake stacks with almond butter (I’m obsessed with that stuff) and raspberries. But feel free to add any other fruits or nut butter. Alternatively, you can drizzle more maple syrup on top, add blueberries or chocolate chips into the pancake batter, and enjoy the hell out of this delicious breakfast treat. 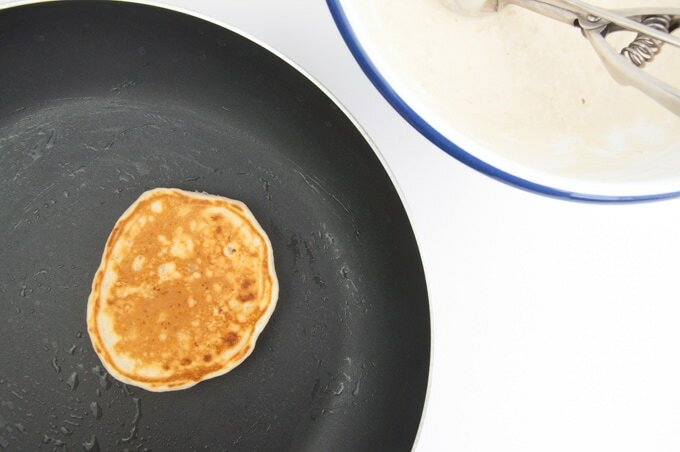 These pancakes are made completely without white sugar. They are sweetened only with bananas and maple syrup. 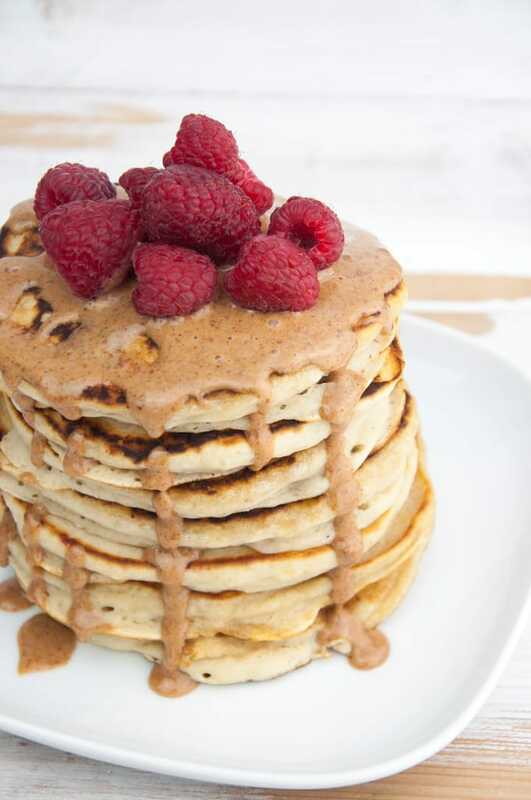 So I consider these pancakes to be a much healthier alternative to traditional pancakes. Also, they don’t contain any animal products! And there’s only minimal oil. 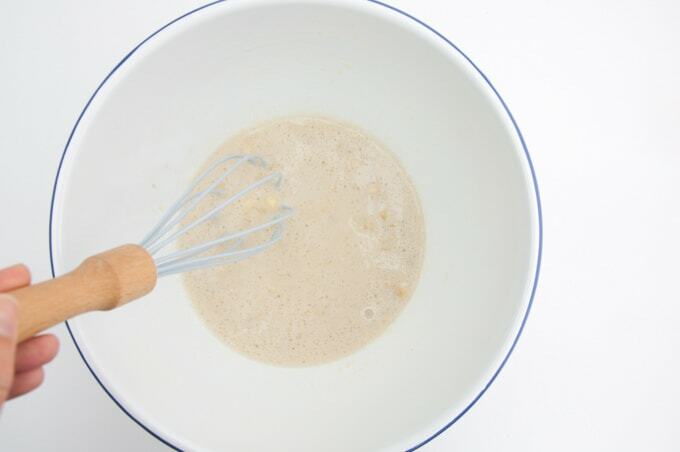 If you want to make these pancakes even healthier, you can use a mix of spelt and wheat flour or use whole wheat flour. How to make pancakes without eggs and dairy? Pancakes without eggs and dairy? It’s totally possible! You don’t even need any weird egg replacement powders. For these Vegan Banana Pancakes, I’ve used mashed bananas and a bit more baking powder than usual. This results in the fluffiest pancakes ever! And they hold together perfectly. No need for eggs at all! I promise. As for the dairy, I’ve simply used plant-based milk (in this case rice milk but you can use any you want!). I hope you enjoy these as much as I do! Let me know if you give them a try! Who said you needed eggs for delicious pancakes? These are the fluffiest vegan pancakes ever and you don’t even need any weird, powdery egg replacements for them. I’ve topped the pancakes with almond butter and raspberries. What a start into the day! 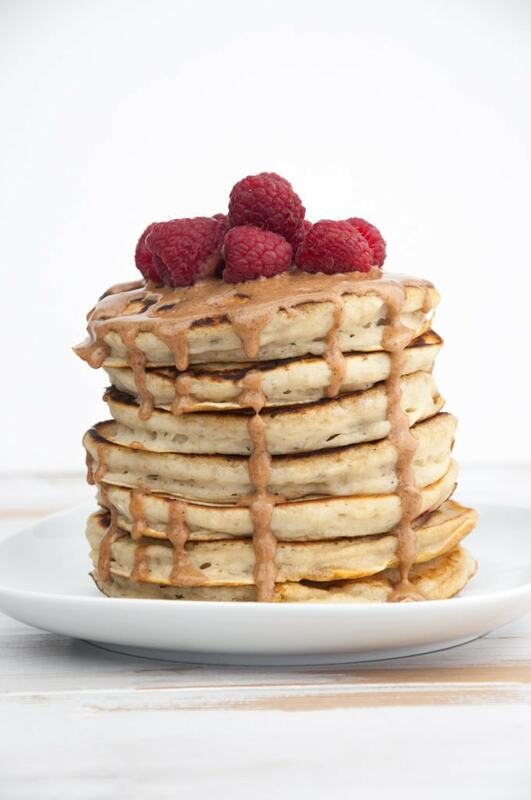 Stack the pancakes, drizzle with almond butter and top with fresh raspberries. Love this recipe! I could eat these pancakes every day. Me too!! Thank you so much, Antonia! 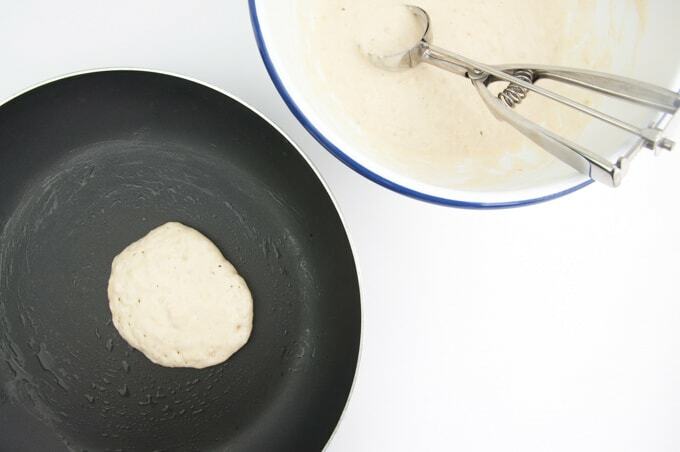 This is the best pancake recipe I’ve come across! They turned out so fluffy, I was amazed! These are AUHmazing!! I’ve made them twice. The first time I followed the receipe, the second time I subbed coconut flour. DO NOT, I repeat, DO NOT sub coconut flower! It’s disasterous! These are awesome! Left out the oil, and replaced 1/2 the all purpose flour with whole wheat. Added a few chocolate chips to half the batter for my 10 year old. So good! She didn’t even add maple syrup! First attempt at vegan pancakes and need to go no further. Thank you! These are soooo good! And very easy to make. 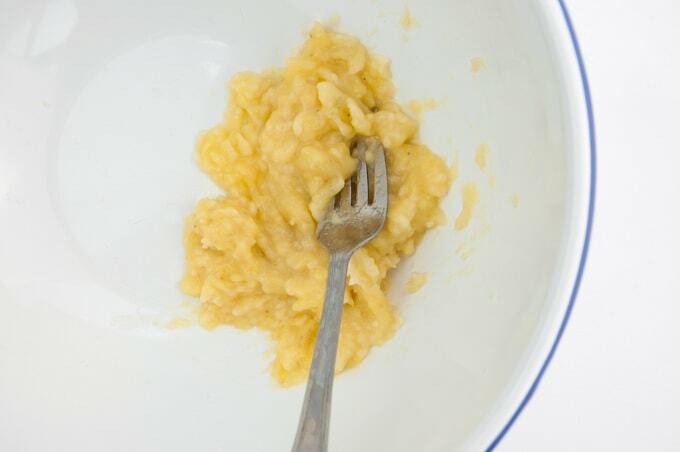 I’ve been vegan for 5 years and this is my favorite breakfast recipe I’ve foud because it’s so simple and yet so delicious. Thank you for sharing. These are by far the best pancakes ever! I just tried out this recipe this morning and the kiddos went nuts about them 🙂 I didn’t have buttermilk and I used the substitute version. It came out perfect! Thank you for your awesome recipe, as always. I love this recipe and I make it all the time. I would like to know about doubling or even tripling the recipe because I never find it’s enough. The pancakes are so good. If I double it, should I just double the quantities of all the ingredients, even the baking powder or are there some adjustments to be made? Would love some advice. Hi Maria, you can double/triple all of the ingredients. These are SO fluffy and think, I absolutely love them! The best vegan pancakes I made in a long while. Thank you so much :D ! I’m SO glad to hear this, Mateo! Bianca, you’re the best. I didn’t know I could adjust the servings in the recipe box, saves me having to double and triple all the quantities in my head. I’m going to make a double batch right now. Yay! Great recipe. I made this with 3/4 cup gluten free plain flour and 1 cup buckwheat flour. Wizzed the liquid and banana in the Nutribullet before mixing. Also added some chocolate chips. Absoulutely great. Worked a treat. 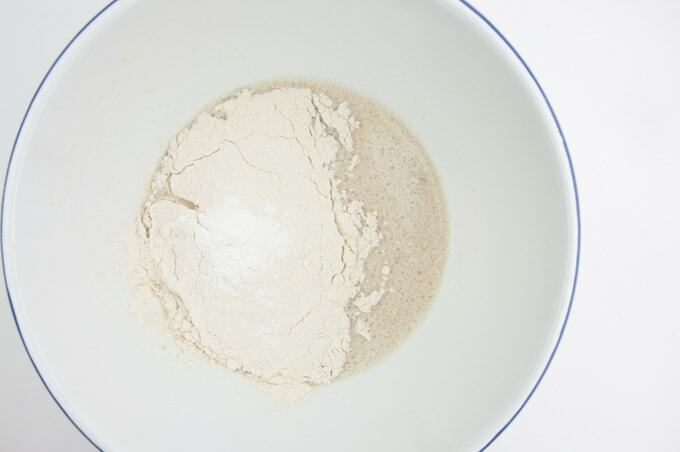 Now trying 1 cup wholemeal flout and 3/4 cup plain flour for the non GF and so far looks good too. I love this recipe and I make it all the time. I would like to know about doubling or even tripling the recipe because I never find it’s enough.